Dr. DeMarco was one of the founding physicians of Allergy & Asthma Specialists of North Florida. 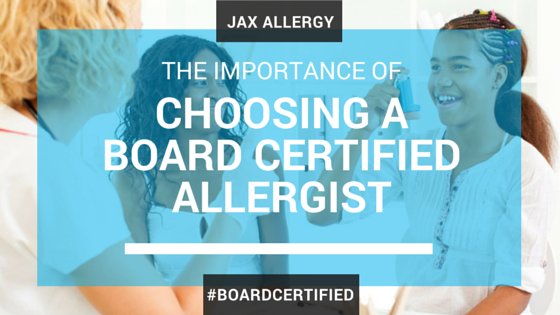 He is board certified by the American Board of Allergy & Immunology- a conjoint board of American Board of Internal Medicine and American Board of Pediatrics. Dr. DeMarco graduated from the University of Scranton with degrees in Biology and Neuroscience. He attended Medical College of Pennsylvania/Hahnemann University in Philadelphia where he received his M.D. in 2000. Dr. DeMarco also received his MBA from the University of Massachusetts Isenberg School of Management. His medical internship and residency training in Internal Medicine were completed at the University of South Florida where he cared for patients at the Tampa General Hospital, James A. Haley Veterans’ Hospital and Moffitt Cancer Center. Following this training, he remained in Tampa to complete his allergy fellowship at the University of South Florida and pediatric allergy/immunology training at All Children’s Hospital in St. Petersburg, FL. Dr. DeMarco believes that patient care starts with a strong bond between the physician and each individual patient, a relationship that is often lost in the fast-paced medical world of today. Patient education is essential to Dr. DeMarco and he spends a significant amount of time with his patients explaining medical diagnoses, testing and treatment options. He feels that without a clear understanding of his or her underlying condition, a patient may have a difficult time embracing the numerous diagnostic and treatment options available for allergic diseases. Dr. DeMarco also strongly believes in an individualized approach to treatment with the goal of using the “least amount of medications (preferably none if possible) to control symptoms while maintaining favorable outcomes.” His clinical interests include allergic rhinitis (nasal “allergies”), sinus disease, asthma, cough and insect allergy. Dr. DeMarco is a past president of the Florida Allergy, Asthma & Immunology Society. He continues to be involved with numerous committees within the state specialty society. He has been a member of the Board of Directors for the Duval County Medical Society and served as its Vice President from 2016-2018. He also has been nominated as a Duval county delegate to the Florida Medical Association yearly since 2008. He is also a member of the Clay County Medical Society. Dr. DeMarco is a fellow of both the American Academy of Allergy, Asthma & Immunology and the American College of Allergy, Asthma & Immunology. Dr. DeMarco has been author on several peer reviewed articles and textbooks. He speaks regularly to local providers about advanced treatments for asthma and other allergic conditions. Dr. DeMarco believes that it is absolutely essential that any provider who is practicing allergy maintain knowledge of advancements in an ever-changing specialty. Therefore, he is an active participant in the American Board of Allergy & Immunology Maintenance of Certification Program. This completely voluntary and rigorous program “offers physicians a process to keep skills and knowledge current in a changing field where vigilance is key to practicing state-of-the-art specialty medical care”. Outside of work, Dr. DeMarco enjoys hiking, running and spending time at the beach with his wife and two sons.